Institution Department of Gastroenterology, Faculty of Medicine, Oita University, Oita, Japan. 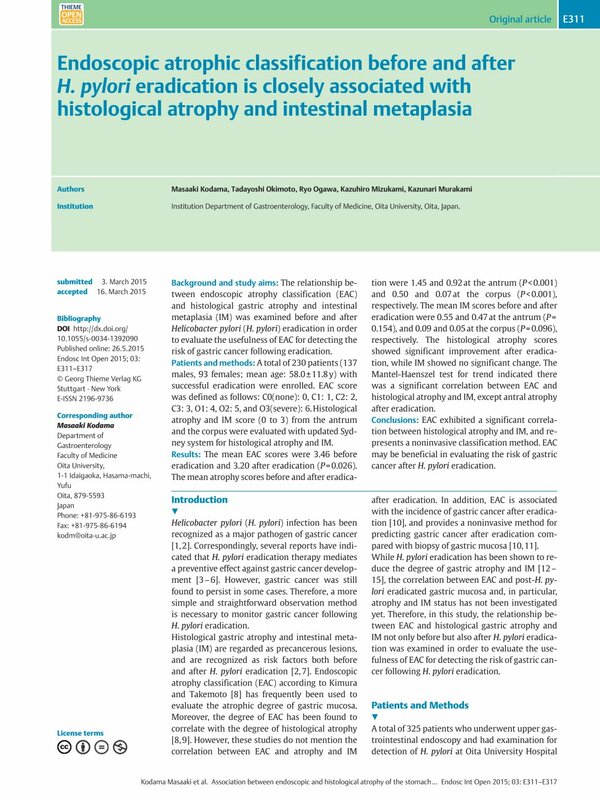 Background and study aims: The relationship between endoscopic atrophy classification (EAC) and histological gastric atrophy and intestinal metaplasia (IM) was examined before and after Helicobacter pylori (H. pylori) eradication in order to evaluate the usefulness of EAC for detecting the risk of gastric cancer following eradication. Patients and methods: A total of 230 patients (137 males, 93 females; mean age: 58.0 ± 11.8 y) with successful eradication were enrolled. EAC score was defined as follows: C0(none): 0, C1: 1, C2: 2, C3: 3, O1: 4, O2: 5, and O3(severe): 6. Histological atrophy and IM score (0 to 3) from the antrum and the corpus were evaluated with updated Sydney system for histological atrophy and IM. Results: The mean EAC scores were 3.46 before eradication and 3.20 after eradication (P = 0.026). The mean atrophy scores before and after eradication were 1.45 and 0.92 at the antrum (P < 0.001) and 0.50 and 0.07 at the corpus (P < 0.001), respectively. The mean IM scores before and after eradication were 0.55 and 0.47 at the antrum (P = 0.154), and 0.09 and 0.05 at the corpus (P = 0.096), respectively. The histological atrophy scores showed significant improvement after eradication, while IM showed no significant change. The Mantel-Haenszel test for trend indicated there was a significant correlation between EAC and histological atrophy and IM, except antral atrophy after eradication. Conclusions: EAC exhibited a significant correlation between histological atrophy and IM, and represents a noninvasive classification method. EAC may be beneficial in evaluating the risk of gastric cancer after H. pylori eradication.